Unless otherwise specified, all materials appearing on this site, including the text, site design, logos, graphics, icons, and images, as well as the selection, assembly and arrangement thereof, are the sole property of The Horn Store., Copyright © 2012, ALL RIGHTS RESERVED. You may use the content of this site only for the purpose of shopping on this site or placing an order on this site and for no other purpose. No materials from this site may be copied, reproduced, modified, republished, uploaded, posted, transmitted, or distributed in any form or by any means without our prior written permission. All rights not expressly granted herein are reserved. Any unauthorized use of the materials appearing on this site may violate copyright, trademark and other applicable laws and could result in criminal or civil penalties. Your receipt of an electronic or other form of order confirmation does not signify our acceptance of your order, nor does it constitute confirmation of our offer to sell. The Horn Store reserves the right at any time after receipt of your order to accept or decline your order for any reason. These Conditions will supersede any terms and/or conditions you include with any purchase order, regardless of whether The Horn Store signs them or not. We reserve the right to make changes to this site and these Conditions at any time. After you opt-in, if you change your mind, you may withdraw your consent for us to contact you, for the continued collection, use or disclosure of your information, at any time, by contacting us at [email protected] or mailing us at: The Horn Store 4164 Austin Bluffs Pkwy #142 Colorado Springs CO US 80918. Our online store is hosted by 3dcart. They provide us with the online e-commerce platform that allows us to sell our products and services to you. We will gladly accept the return of products that you are unhappy with for 30 days from the date of purchase. All returns must be in unused, re-saleable condition and will be subject to a 10% restocking fee. Refunds will be issued to the credit card or PayPal account used for the purchase. Shipping charges are not refundable. Shipping Time -- Most orders will ship within two business days. Orders are not processed or shipped on Saturday or Sunday, except by prior arrangement. We cannot guarantee when an order will arrive. 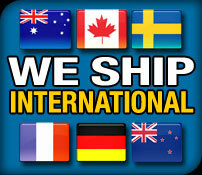 Consider any shipping or transit time offered to you by The Horn Store or other parties only as an estimate. We encourage you to order in a timely fashion to avoid delays caused by shipping.